Last week I argued that driving freeways through the heart of urban neighborhoods can have devastating effects. In case you’re skeptical about that claim, consider the case of McRee Town, a St. Louis neighborhood not far from the Forest Park Southeast neighborhood I mentioned in my earlier post. Flora Place, Magnolia Avenue and Tower Grove Place have always been pillars of stability for the Shaw and Southwest Garden neighborhoods. Although some of Shaw’s streets are notoriously rough — a police officer was shot last year in the 3800 block of Shenandoah — it has managed to attract a fair share of rehabbers who are pushing property values upward. Until 1973, McRee Town and an area to the east called Tiffany were vibrant parts of the Shaw neighborhood. That changed when Interstate 44 was completed and the two neighborhoods were severed from the stability of Shaw’s garden and the elegant homes that surround it. “When I moved here, we had a drugstore, we had a laundromat. We had a Baskin-Robbins at 39th near McRee,” recalls Norma Cox, who bought her home on Lafayette Avenue in 1976. She remembers the day the city blocked the underpass at Thurman Avenue so that traffic could not pass between Shaw and McRee Town. “That’s when I knew we were cut off,” she says. The same conditions that make for an economically successful urban neighborhood also make for a safe neighborhood. A steady flow of pedestrian traffic makes a street safer, because criminals don’t want to be confronted by passers-by. Neighborhoods with many successful businesses tend to be safer, because business owners tend to be proactive about dealing with troublemakers in the vicinity of their properties. When I-44 divided McRee Town from the rest of Shaw, it undermined these basic preconditions for safe neighborhoods. Foot traffic between the two neighborhoods plummeted. Because it was smaller, the McRee Town side suffered disproportionately from the loss. The fall in foot traffic meant that the neighborhood couldn’t support as many businesses at it had before. The drug store and the Baskin-Robbins closed. Soon people who had a choice started leaving. The neighborhood rapidly deteriorated, and by the late 1980s the neighborhood was one of the city’s most notorious slums. Drug dealers moved in. Crime skyrocketed. Houses were abandoned. Today there’s no neighborhood called McRee Town. Officials from the nearby Botanical Garden hatched a plan to level McRee Town and replace it with suburban-style detached single-family homes. The RFT did its story in 2003, just before the demolitions began in earnest. 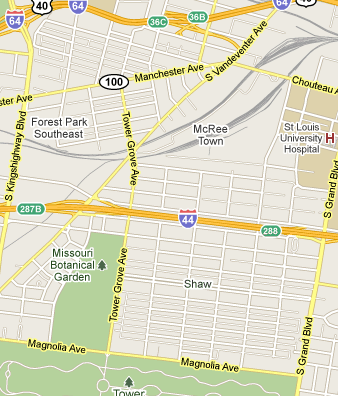 By the time I left St. Louis in 2008, it looked like a patch of suburbia had been transplanted into the city. The Garden accomplished its immediate objective, which was to remove a nearby eyesore. But this kind of slash-and-burn redevelopment evades the city’s problems rather than addressing them. Botanical Heights will be nicer than McRee Town mostly because the new homes will be too expensive for the old residents to afford. 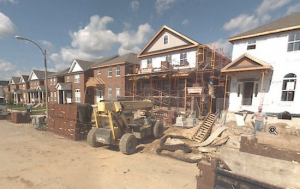 The old residents were given relocation assistance, but in the long run they’re fighting for a dwindling supply of affordable housing, as the city steadily demolishes low-income neighborhoods and replaces it with suburban-style single-family homes that are out of reach for their former residents. In the long run, it’s not clear that Botanical Heights will fare any better than McRee Town did. The fundamentals of the neighborhood haven’t changed. It’s still a long, narrow neighborhood sandwiched between railroad tracks and a freeway. The low density of the new housing means that it’s even less likely to sustain the foot traffic and neighborhood businesses that help ward off crime. 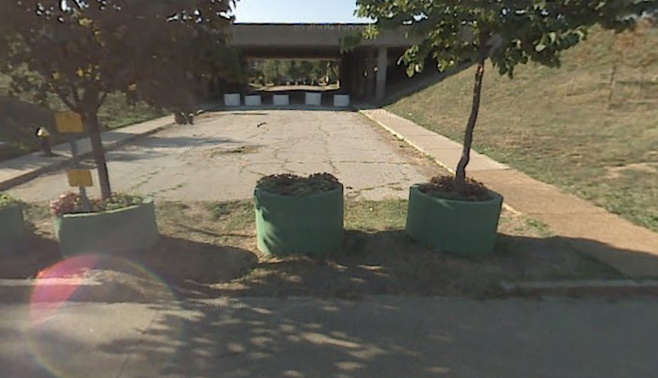 And the state has apparently been flirting with making the neighborhood even more isolated by completely sealing up the underpasses that connect it to the other side of I-44. Once the new-house smell fades, Botanical Heights could easily begin to deteriorate in the same way that McRee Town did. Hey sorry I missed the Envolve chat last night — they sell those 24 ounce beers at the ballpark, so yeah. I’m a little unclear on why the underpass was closed to traffic in the first place. Did the highway construction necessitate that move? The blog post you linked to mentions that one possible reason was “to cut crime”. But according to the reasoning laid out above, which seems solid to a layman like me, it would have had just the opposite effect. Experience seems to have borne that out. This stuff is a bit depressing to think about, because the idea of removing a major highway seems to border on absurd. So it’s like the damage has been done in a lot of these cities, and there’s no elegant way to undo it. Rhayader: I think the story was that once the freeway was constructed, the crime problems became much worse north of the freeway than south of it. So the folks on the south side lobbied for it to be closed to make sure the problems to the north wouldn’t spill over. Ahh ok, a little NIMBY-ism. I guess I can’t fault people for doing whatever they can to keep their neighborhood safe, but that move sounds a bit misguided to me. Being stuck with the ramifications of the highway construction, they probably felt there wasn’t much choice. The upper east side is the one neighborhood I know personally. There aren’t very many businesses (although there are some), it’s mostly large apartment and condo buildings for the superrich, plus the Met. Foot traffic is assured, but that’s true for everywhere in NY and it doesn’t seem to help a lot of neighborhoods. It seems to me St. Louis has the right idea insofar as the best way to reduce crime in a neighborhood is to get poor people to move elsewhere. Well done, Tim. I’m sure people can find things to pick at, here, but I think the notable irony for those of us who live in that area (I’m a Shaw resident), is this: in the long run, the barriers of which you speak – what we locals “affectionately” call the Schoemehl Pots (after the illustrious mayor who dotted the entire city with them) – did more harm than good. The same barriers that supposedly keep crime out, are the same ones that concentrate it. At the end of the day, it doesn’t solve the problem. Furthermore (funny how the worm turns), now the residents of the all new Botanical Heights cast suspicions about our neighborhood – as if we’re now the problem (they have bigger fish to fry in Tiffany, to their east, IMO). Lastly, to those who argue that simply suburbanizing and gentrifying neighborhoods is the answer to stabilizing cities – I would respectfully submit that such an approach is short sighted. Those folks who were displaced from McRee Town ended up in places like Benton Park West, Gravois Park, Dutchtown East and Mount Pleasant. Two of those four neighborhoods now rank as South City’s most dangerous. And, the stabilizing neighborhoods next to them (Tower Grove East, Benton Park, Carondelet) are faced with the same dilemma once shared by those of us in Shaw and Southwest Garden. Let’s just say we successfully gentrified the entire city. We will have succeeded merely in moving poverty to the suburbs (this is already happening in the northern 1st-tier suburbs). Again, it doesn’t solve the problem. Finally, poverty does not necessarily equal crime. One need only look at billionaire Ponzi schemers to dispute that myth. Crime is a choice tied to attitude and heart. Change *that* and you address the crime problem. Absolutely. The Wire touched on this — during one of the “New Day Co-op” meetings, the east siders were talking about moving their business “out to the county” as Johns Hopkins bought up more and more property on Baltimore’s east side. There were also conversations between cops that alluded to the same dynamic. Crime is crime, and simply moving it around isn’t much of an accomplishment. Wilson: foot traffic and businesses aren’t the only ways to reduce crime. Another strategy that works extremely well is to have property values be so high that poor people can’t live there. That works in specific areas (the Upper East Side in NY, Georgetown in DC), but it’s obviously not a solution everywhere. And it’s inherently fragile. If a formerly upscale neighborhood starts to decline, the process can snowball because other crime-fighting factors aren’t in place. This is what I worry is going to happen in Botanical Heights. As long as all the homes are occupied by upper-middle-class people, there’s unlikely to be much of a crime problem. But if any adjacent neighborhoods start to go bad, it can easily spill over into BH because BH doesn’t have other institutions to mitigate crime. ready to install but was shut down by a (6) member Botanical commision. Dr. Peter Raven promised he would never go north after his failed attempt to mow down all the nice folks on Shaw for a parking lot.